Just as Australians and Brits argue over marmite versus vegemite, so the Australians and Kiwis argue over who invented the pavlova. It is a speciality of both countries but despite a lot of research by food historians, its still hard to pin point who first used the name. Legend is that the dessert was named after the ballerina Anna Pavlova who toured Australia and New Zealand in the 1920s. The dessert is a concoction of meringue and cream and fruit and is light and airy and crunchy and chewy and luxuriously wonderful. It is one of my favorite desserts and I usually ask my Mum to make it for me when I go home for a visit. It works well with raspberries, strawberries, mango, passionfruit and kiwi – and can therefore be adapted to whatever is seasonal or available. I have seen a Nigel Slater version with blackcurrants. I usually associate pavlova more with summer when raspberries and strawberries are in season but it works any time of year with tropical fruit. Yesterday when I wanted to make a pavlova to use up some of the egg whites left from our last batch of ice cream I called my mother for advice. Warning – this recipe is much easier if you have an electric whisk or mixer. It also takes a lot of time, most of it waiting, but it certainly isn’t a last minute option. If you keep your eggs in the fridge you will probably need to start preparing a minimum of 4 hours before you want to serve but longer is better as you want to let the pavlova completely cool in the oven. The good news is that you can bake it ahead of time. Recipe to serve 6. 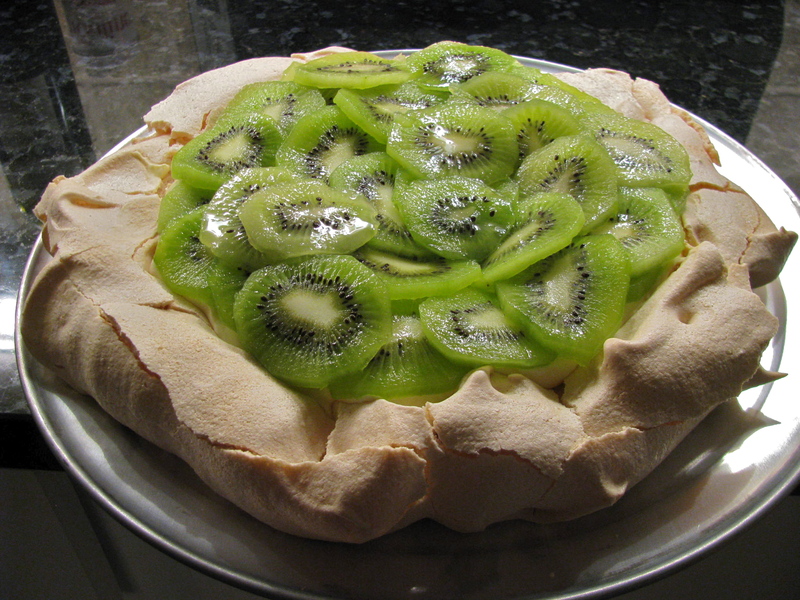 If you need to feed more people I would suggest making more than one pavlova. Making it any larger will make it difficult to fit on the baking sheet and harder to handle. 7 oz fine sugar (I used organic Florida cane sugar). If your sugar is too coarse you can whizz it in the food processor. Seperate the eggs (unless you are using up leftover egg whites). Make sure they are room temperature or wait for an hour. Room temperature eggs will whisk to a greater volume. 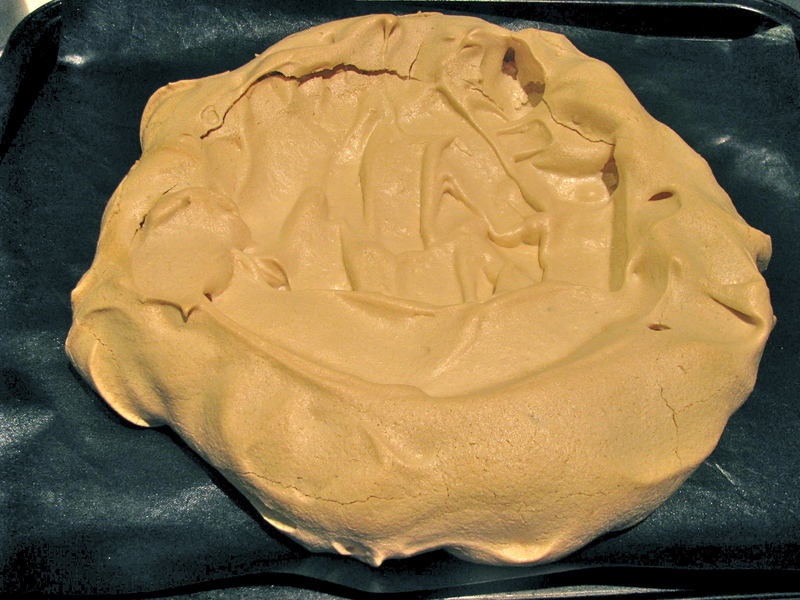 Using a spatula turn the meringue mixture onto the baking sheet and spread it out into a 9 inch circle. It should be indented in the middle with higher walls around the edge, so that you can fill the center. 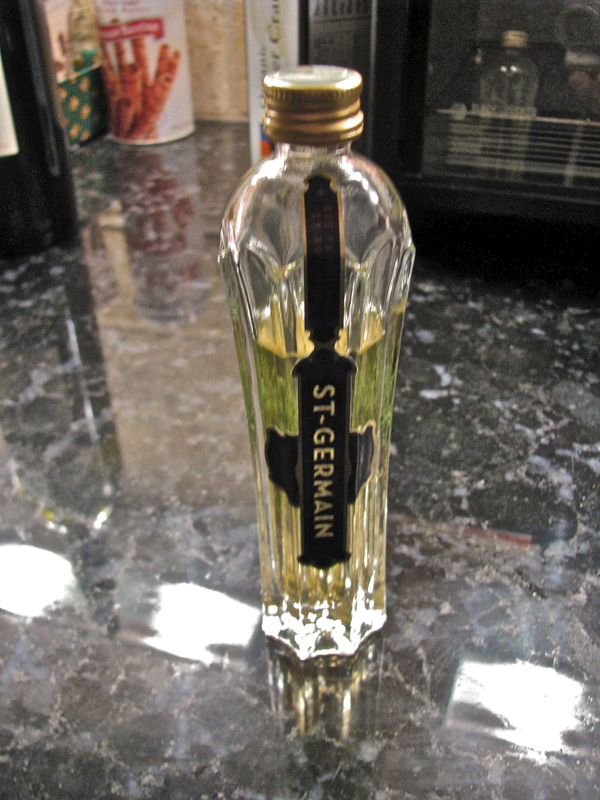 St Germain is an elderflower liqueur and it is sweet and floral. It went very well with the kiwi fruit. If you were using berries you might want to use crème de cassis instead. You can also fold in lemon curd into the whipped cream. There are a lot of possible fillings. Whip the cream (Kitchen Aid speed 8) until stiff and then stir in the sugar and 2 tablespoons of the liqueur. Spread the cream in the center hollow of the pavlova. It doesn’t have to be pretty, you are going to cover it with fruit. Just before you serve it, layer the sliced kiwi fruit on top of the cream and then drizzle the remaining 2 tablespoons of the liqueur on top. I’m looking forward to trying this recipe—it certainly sounds like a ‘cut above’ meringues I have prepared in the past. Would St. Germaine be easy to find? It seems to be fairly easy to find in Columbus. Wow, this looks fantastic. I’m going to try this one out. I had some. (Nyah, nyah!!) It was absurdly good. 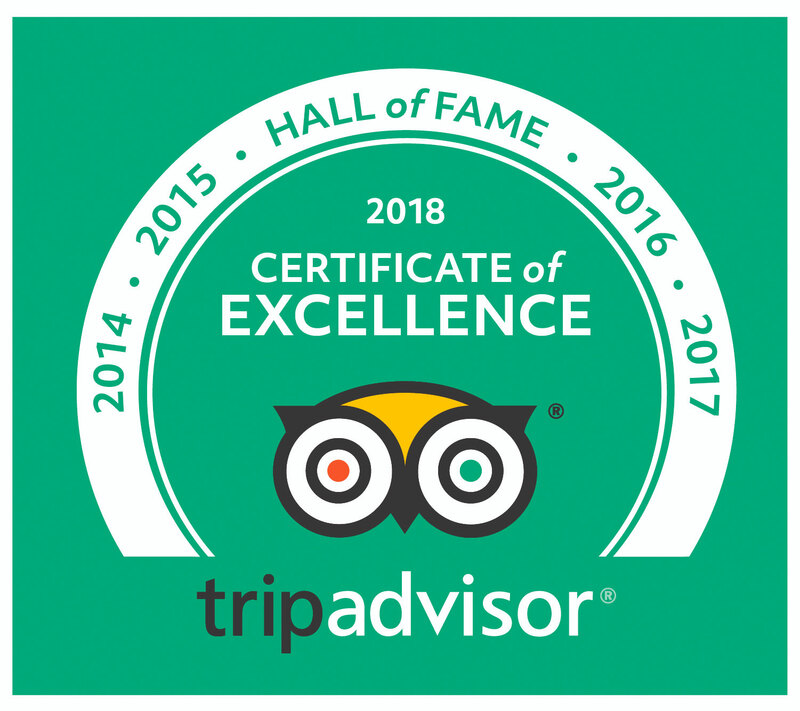 A mate encoraged me to check out this post, great post, fanstatic read… keep up the cool work!